What’s your concrete story? Perhaps you are the owner or property manager of a commercial or retail space with concrete floors that are subject to heavy traffic. Maybe you are a homeowner with a polished concrete garage or a decorative concrete outdoor living area.More and more business-, industrial site-, and even home-owners are discovering the cost effective and attractive solutions polished concrete represents. Since most modern structures are built on a concrete slab, the stage is already set for a durable, abrasive-resistant, and potentially stunning final surface, without the need for extensive installation costs and additional materials. TECHSTONE is one of the leading providers of concrete polishing and other services. Our experienced technicians will prepare your existing concrete surface with diamond-encrusted pads and a chemical densifier, then stain, polish and finish according to your specifications. When texture and color are added to give the appearance of stone, brick, slate, and sometimes even wood, it is considered stamped concrete. The array of possibilities combined with great durability and a cost which is typically lower than the materials it imitates make stamped concrete an easy choice for new construction and renovation projects alike. Stamped concrete is a desirable finish for driveways, patios, commercial roads and parking lots, and even interior floors. However, over time, dyes may fade and the surface can start to look patchy and unpresentable. TECHSTONE can rejuvenate faded or damaged stamped concrete and get it looking like new again. There are a variety of stains and dyes which can be applied, re-applied or incorporated into concrete surfaces to enhance or restore the appearance or your flooring. Color is achieved by using dry shakes or color hardeners, powder or liquid releases, integral colors or acid stains. All these products may be combined to create even more intricate designs. Top it off with polishing and the results can be both durable and strikingly beautiful, and a wide range of looks can be achieved. The top layers of your concrete slab can be ground down to expose the aggregate materials, then polished for a look which can mimic terrazzo at a fraction of the cost. 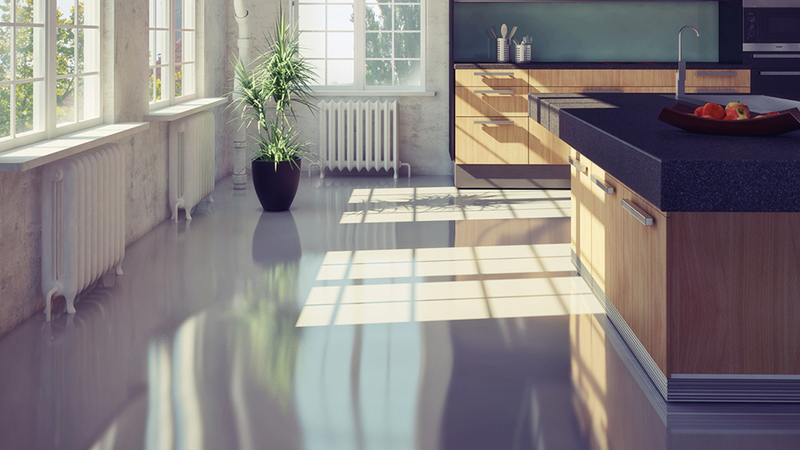 In addition to the things mentioned above, polished concrete flooring has many other benefits. It is incredibly low maintenance — moping with warm soapy water will do the trick. It is hard-wearing and will not chip or dent like softer surfaces. Polished concrete reduces dust mite and allergen problems, and does not support mold growth. Evidence suggests highly reflective polished concrete reduces lighting needs and enhances natural lighting. Its relatively high coefficient of friction also gives it a degree of slip resistance. A concrete floor that has been hardened and polished will have an extremely long life expectancy compared to other flooring. If this sounds like a good solution to you, please don’t hesitate to contact us. In addition to our concrete services, we provide services for natural stone, tile and grout, and terrazzo. For a free estimate on concrete cleaning and sealing, refinishing, repair, acid washing and staining, polishing, and other concrete services, use our online contact form or call (888) 570-2859 today.